The present study aims to provide an up-to-date overview of the situation concerning ICT at Primary and Secondary educations centres, analysing both achievementes and other aspects in need of improvement over the coming years. 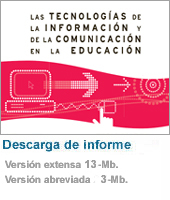 This project was carried out within the framework of the Internet en el Aula (Internet in the Classroom) programme, whose aim is to promote the non-discriminatory development of the information society at educational centres, and to foster the use of ICT as a key tool for communication, understanding and co-operation. Internet en el Aula involves the participation and collaboration of the Spanish Ministry of Industry, Tourism and Trade, via the Red.es Public Body, the Ministry of Education and Science, via the National Centre for Educational Information and Communication, and the Regional Governments of Spain.